Last weekend I took some clients to an ongoing show Samuel Githinji at the gloriously selective Red Hill Art Gallery just outside of Kiambu. The show entitled “Decay-Survival-Healing” grapples with how society seems to be falling apart in so many ways – economic inequality, environmental degradation, political instability and nepotism, corruption, etc. 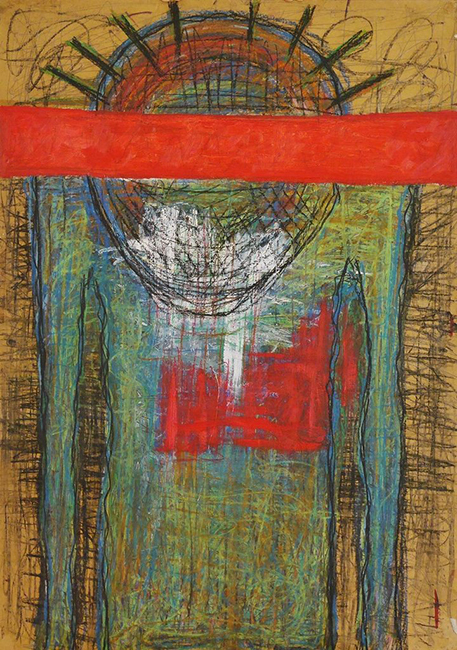 Samuel’s previous work featured many self-portraits – in the style of Basquiat – where he laid bare his personal doubts, insecurities, and inner demons. This body of work continues this dialogue but does it in a way that is a bit more abstract – borrowing the patchwork motif from El Anatsui to express the idea that our society is basically a patchwork experiment of decaying components. Definitely an intense show for viewers, but the kind of show I like. It eschews the butterflies, lions, and giraffes commonly found in the street vendor stalls and tackles challenging issues head on. Githnji in this way is compelling and brave artist, to make work that makes the audience uneasy. One of my favorites is his piece “Blankets,” reminiscent of a style from a few of Ghana’s most well-regarded artists (El Anatsui and Serge Attukwei Clottey to mention a few). The piece features a patchwork of worn and torn fabrics, representative of societal decay – but pieced together in a semblance of getting it all back together – the healing. I suppose the term from the show title that sticks most with me is “Survival,” as these pieces feature Githinji’s face and are focused on the human impact of this decay. To me, this work is about picking up the tattered pieces and piecing something together that sustains life – but not much more. Be sure to check this show out this weekend, as it wraps next week. Check out a preview of the show here. “Decay-Survival-Healing” runs through September 3rd.